An experimental gene therapy that turns a patient's own blood cells into cancer killers worked in a major study, with more than one-third of very sick lymphoma patients showing no sign of disease six months after a single treatment, its maker said Tuesday. 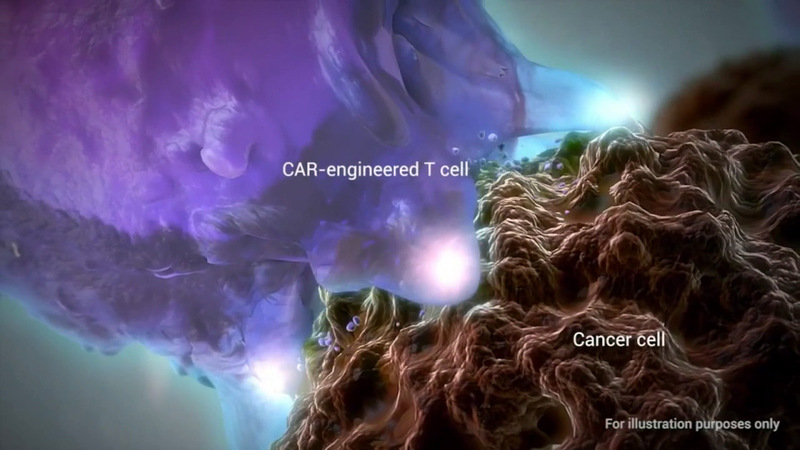 Its sponsor, California-based Kite Pharma, is racing Novartis AG to become the first to win approval of the treatment, called CAR-T cell therapy, in the U.S. It could become the nation's first approved gene therapy. A hopeful sign: the number in complete remission at six months - 36 percent - is barely changed from partial results released after three months, suggesting this one-time treatment might give lasting benefits for those who do respond well. "This seems extraordinary ... extremely encouraging," said one independent expert, Dr. Roy Herbst, cancer medicines chief at the Yale Cancer Center. The worry has been how long Kite's treatment would last and its side effects, which he said seem manageable in the study. Follow-up beyond six months is still needed to see if the benefit wanes, Herbst said, but added, "this certainly is something I would want to have available." The therapy is not without risk. Three of the 101 patients in the study died of causes unrelated to worsening of their cancer, and two of those deaths were deemed due to the treatment. It was developed at the government's National Cancer Institute and then licensed to Kite. The Leukemia and Lymphoma Society helped sponsor the study. Results were released by the company and have not been published or reviewed by other experts. Full results will be presented at the American Association for Cancer Research conference in April. The company plans to seek approval from the U.S. Food and Drug Administration by the end of March and in Europe later this year. The treatment involves filtering a patient's blood to remove key immune system soldiers called T-cells, altering them in the lab to contain a gene that targets cancer, and giving them back intravenously. Doctors call it a "living drug" - permanently altered cells that multiply in the body into an army to fight the disease. Patients in the study had one of three types of non-Hodgkin lymphoma, a blood cancer, and had failed all other treatments. Median survival for such patients has been about six months. Kite study patients seem to be living longer, but median survival isn't yet known. With nearly nine months of follow-up, more than half are still alive. Six months after treatment, 41 percent still had a partial response (cancer shrunk at least in half) and 36 percent were in complete remission (no sign of disease). "The numbers are fantastic," said Dr. Fred Locke, a blood cancer expert at Moffitt Cancer Center in Tampa who co-led the study and has been a paid adviser to Kite. "These are heavily treated patients who have no other options." One of his patients, 43-year-old Dimas Padilla of Orlando, was driving when he got a call saying his cancer was worsening, chemotherapy was no longer working, and there was no match to enable a second try at a stem cell transplant. "I actually needed to park ... I was thinking how am I going to tell this to my mother, my wife, my children," he said. But after CAR-T therapy last August, he saw his tumors "shrink like ice cubes" and is now in complete remission. "They were able to save my life," Padilla said. Of the study participants, 13 percent developed a dangerous condition where the immune system overreacts in fighting the cancer, but that rate is lower than in some other tests of CAR-T therapy. The rate fell during the study as doctors got better at detecting and treating it sooner. Roughly a third of patients developed anemia or other blood-count-related problems, which Locke said were easily treated. And 28 percent had neurological problems such as sleepiness, confusion, tremor or difficulty speaking, but these typically lasted just a few days, Locke said. "It's a safe treatment, certainly a lot safer than having progressive lymphoma," and comparable to combination chemotherapy in terms of side effects, said the cancer institute's Dr. Steven Rosenberg, who had no role in Kite's study. The first lymphoma patient Rosenberg treated this way, a Florida man, is still in remission seven years later. There were no cases of swelling and fluid in the brain in this or any other study testing Kite's treatment, company officials said. That contrasts with Juno Therapeutics, which has had a CAR-T study put on hold twice after five patient deaths due to this problem. Company officials would not say what the treatment might cost, but other types of immune system therapies have been very expensive. It's also being tested for some other types of blood cancer.